There is going to be a summit with North Korea, there is not going to be a summit with North Korea, maybe there will be a summit with North Korea. There will be new tariffs applied to trade with China. No, wait, there will not be new tariffs applied to trade with China. Or maybe there will be. Amid ever-changing American relations with Asian countries, it is difficult to know how to invest funds with an eye toward future growth. So, in the month of May, some investors increased their investments in the Stock Market, while others chose to maintain a steady hand. The Spectrem Millionaire Investor Confidence Index (SMICI®) and the Spectrem Affluent Investor Confidence Index (SAICI®) were steady in May, with no movement among Millionaires and only a single point drop among all investors. The SMICI (an index of investors with $1 million in investable assets) remained at 8, marking the first time since May-June 2017 the number was out of double digits for consecutive months. The SAICI (an index of investors with $500,000 in investable assets) dropped to 6, matching the number last seen in October of 2017. The May fielding took place May 22-26, 2018, while plans for the North Korean summit went from yes to no to maybe. In April, the percentage of Millionaires investing in the Stock Market fell to levels not seen in a year. In May, interest climbed back into normal range, with 34.1 percent expressing intentions to invest in Stocks. Stock Mutual Fund investing also rose among Millionaires to 38.3 percent, although that percentage has been in the 40s for most of the past 12 months. Non-Millionaires also expressed a greater interest in Stock investing, but their Stock Mutual Fund investing percentages fell to 24.1 percent, the lowest percentage since Feb. 2016. However non-Millionaires recorded huge jumps in the safety categories of Cash and Real Estate investing; the 12.1 percent of non-Millionaires increasing Real Estate investing was the highest since July of 2013. In May, optimism among females was high while men were less positive. The SAICI and SMICI for females jumped from -4 to 3 (SAICI) and from -9 to 9 (SMICI). The SAICI is a positive number for females for the first time since November. Females reported an increased involvement in Stock and Stock Mutual Fund investing, and lower rates of Cash and Bond Mutual Fund investing. Those females Not Investing in May fell to 40 percent. Among male investors, those Not Investing reached 33.6 percent, the highest mark in over a year. Stock Investing did climb among men to 33.5 percent after a deep dive in April, but Stock Mutual Fund investing fell to 34.2 percent, another historically low number. Both indices for men fell to 8, marking the first time in since October that either number dipped into single digits. 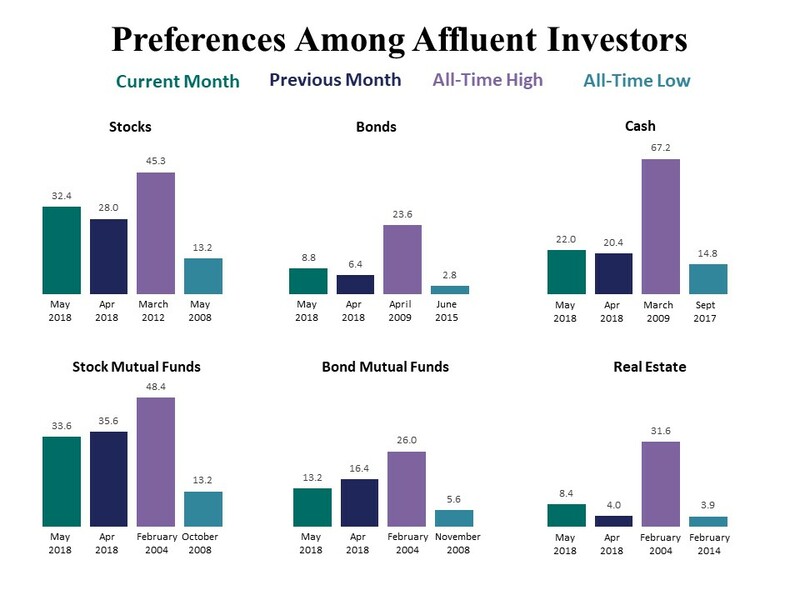 Fifty percent of Democratic investors are choosing not to invest further for the coming month, one of the highest percentages of non-involvement for any segment in Spectrem Index history. At the same time, only 35.29 percent of Republicans said they are staying on the investment sidelines, which was an increase from the month prior. Interest in Stock investing among Republicans jumped 10 percent to 33.3, and interest in Real Estate investing quadrupled to 8.82 percent among Republicans. Democrats reported an increase in the safety markets of cash and Individual Bond investing. The Republican overall indices both rose to 10 after an unseemly drop into single digits in April. Both indices fell among Democratic investors. There are months when retired investors display an unusual level of enthusiasm for investing, and May was one of those months, with increases in every type of investing listed in the index except Cash investing. Among working investors, decisions were varied, and 25.5 percent said they were not adding to their investment portfolios for the month. The SAICI and SMICI, however rose for working investors and stayed in place among retired investors in May.